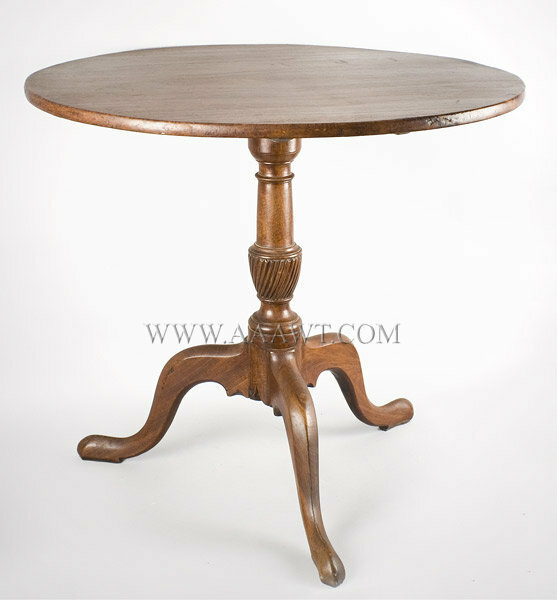 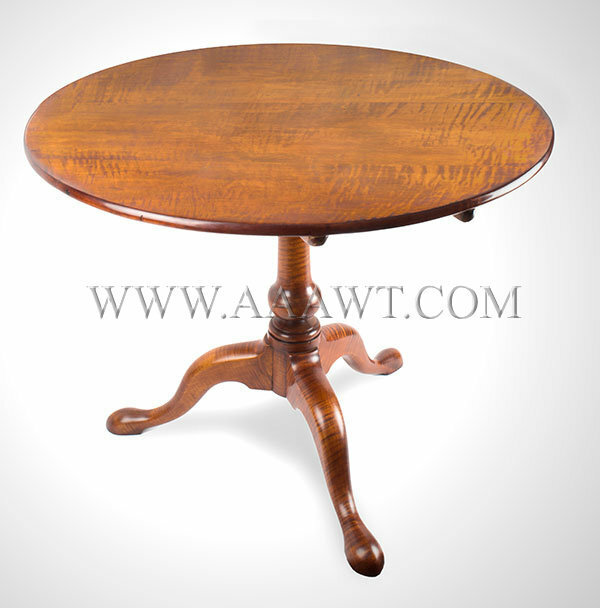 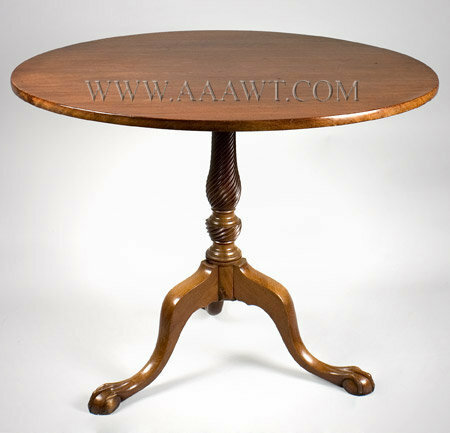 The dished top tilting on a birdcage and baluster and ring-turned standard resting on cabriole legs ending in pad feet; the leg shoulders are reeded. 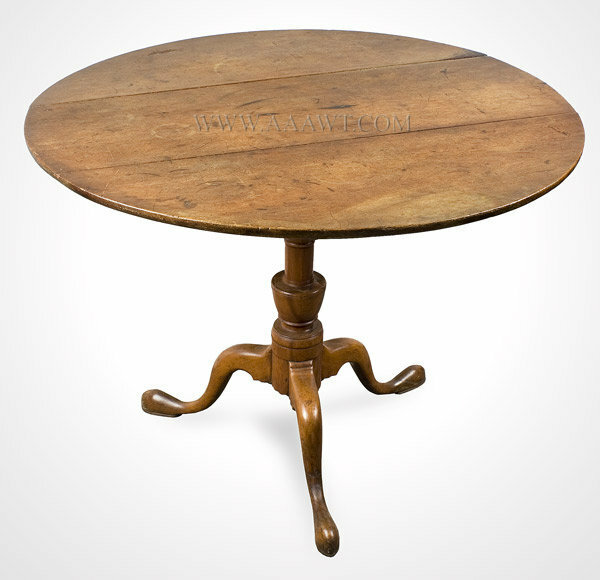 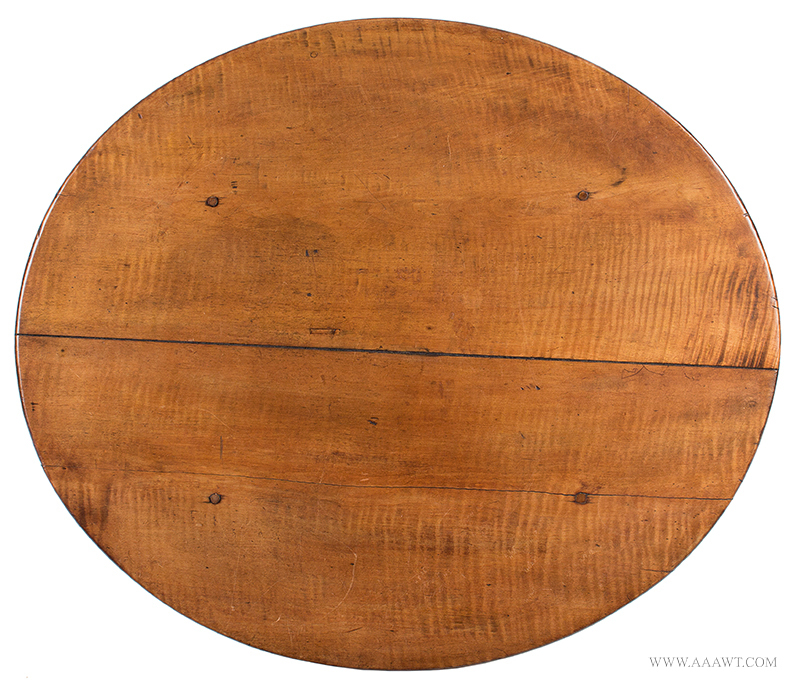 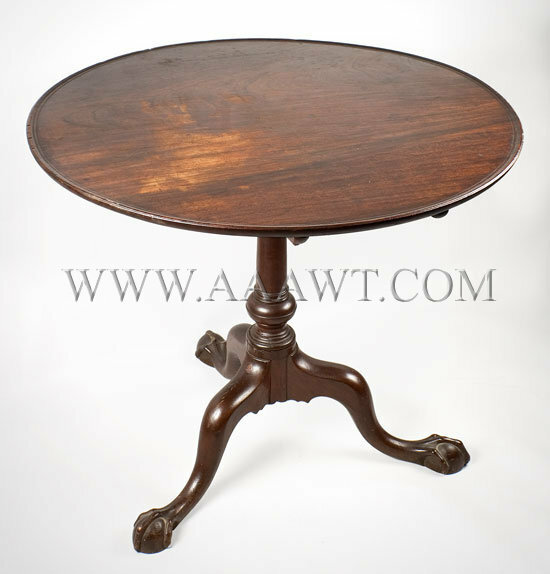 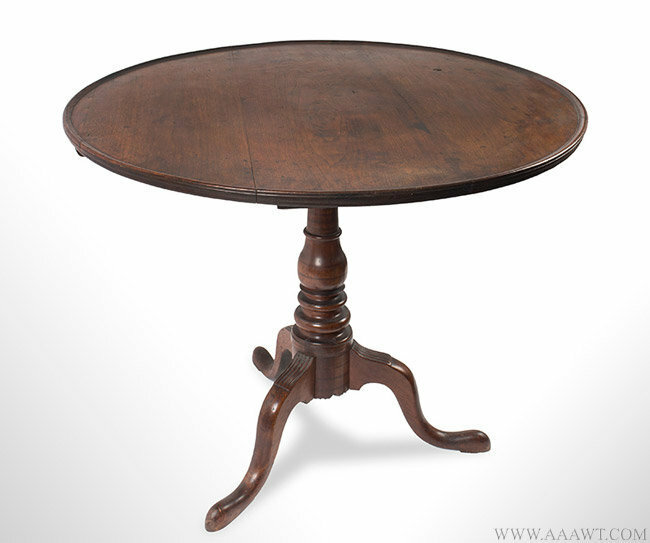 Square tilt-top over turned pedestal raised on ridged cabriole legs resting on slipper feet Retaining full pads; iron lock, wonderful surface. 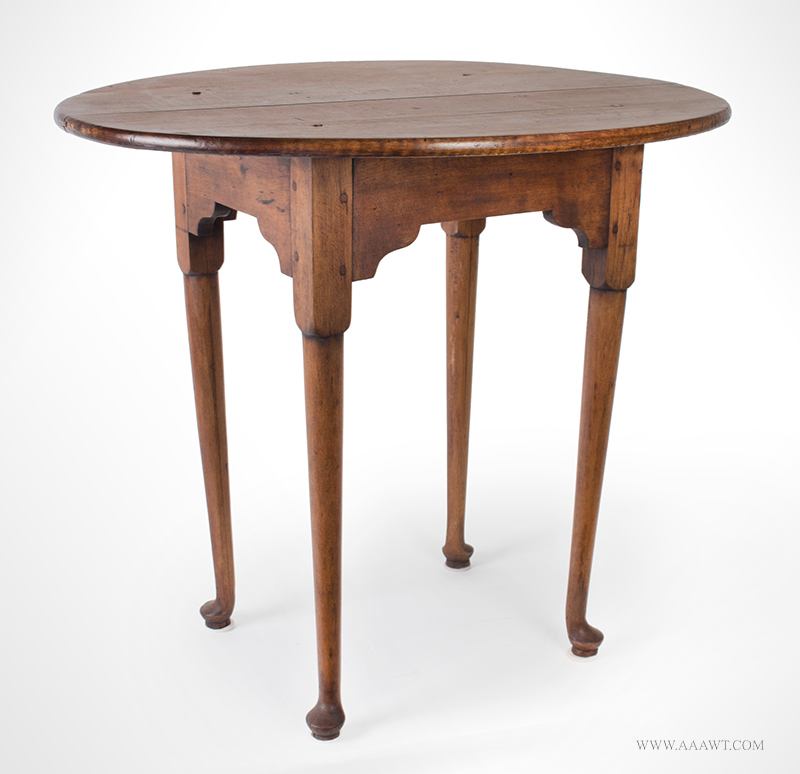 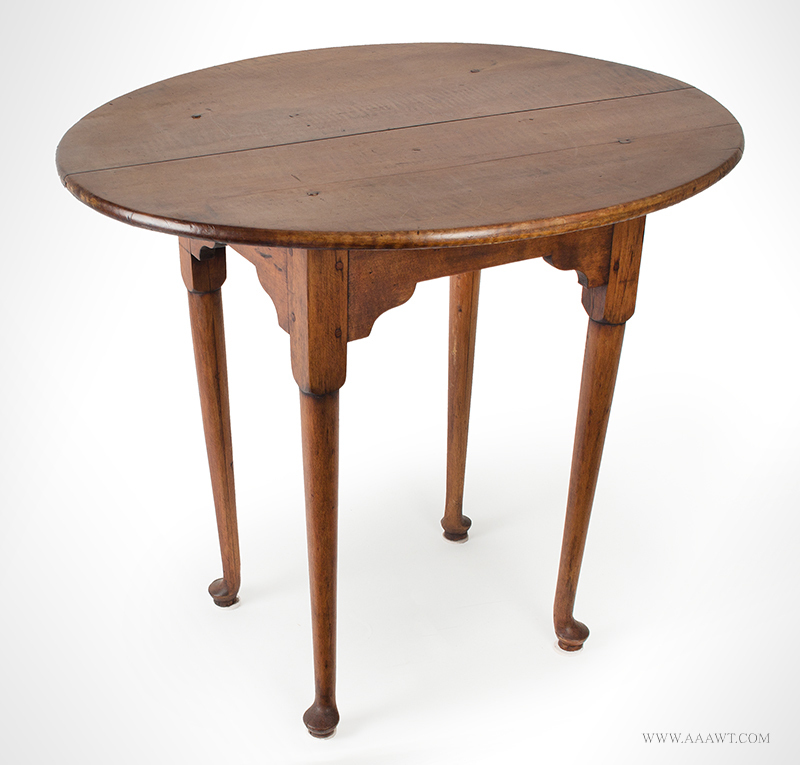 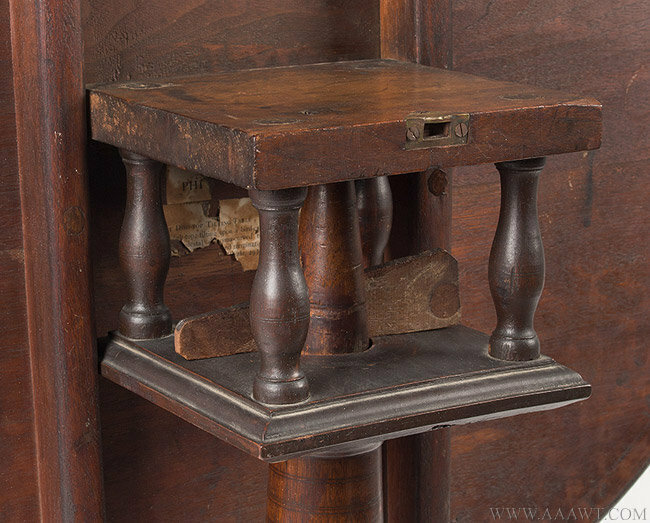 The table features a generous top, a boldly turned shaft and a tri-partite base; dovetailed battens secure the top to birdcage mechanism of extremely robust and whimsical design, with a highly unusual and sophisticated locking device composed of wood, employing the spring-actuated flexibility of the wood itself to engage it. 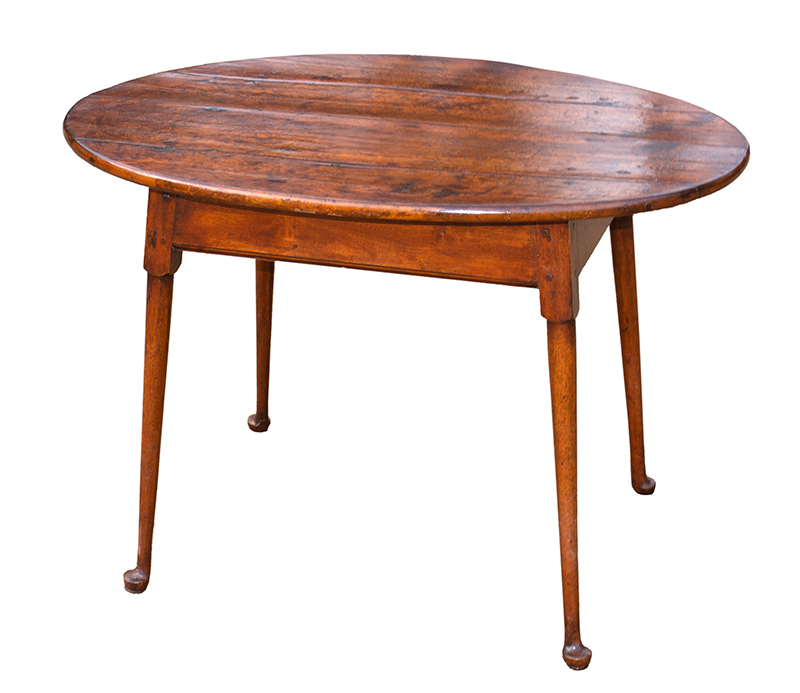 Furniture, page 358, figure 7.5. 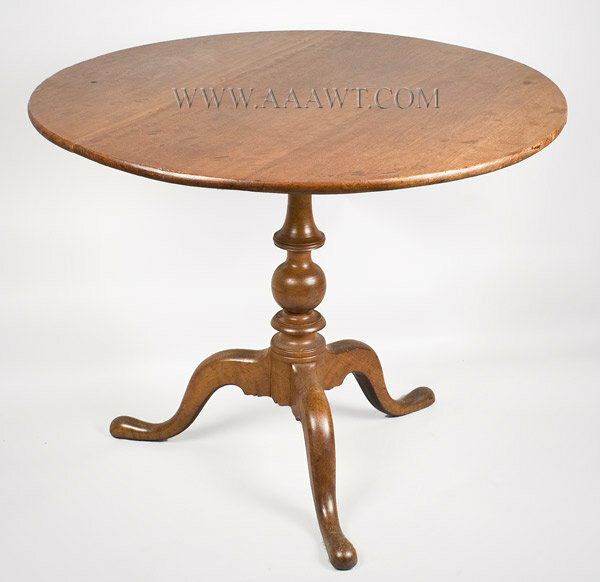 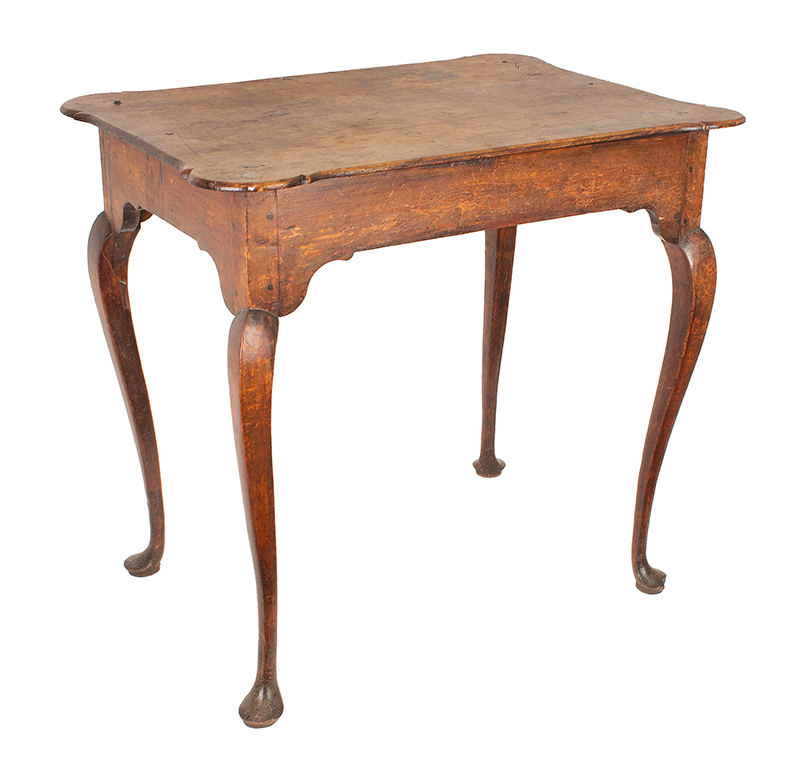 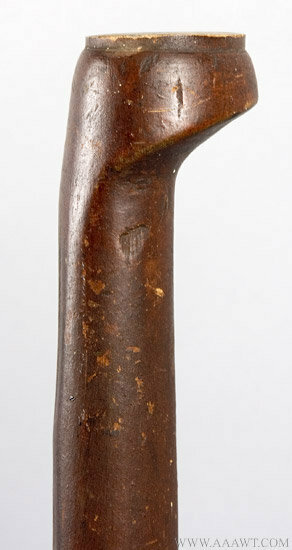 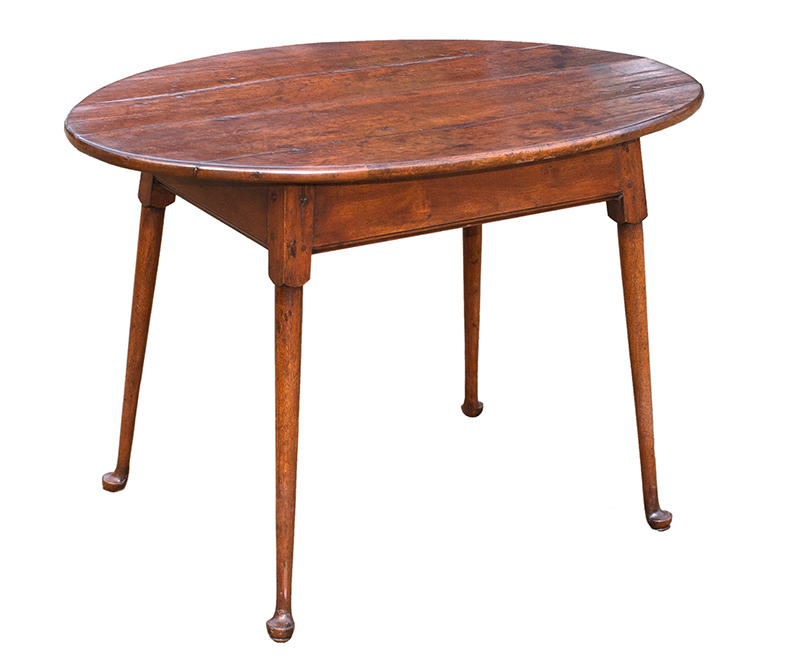 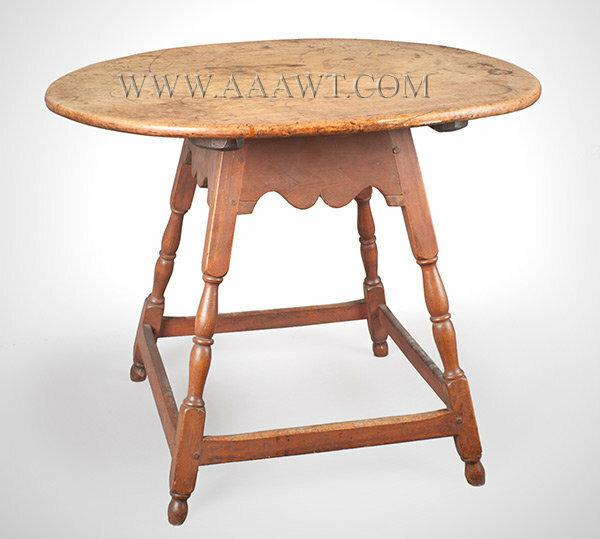 This example features a rectangular top with thumb molded edge projecting above a shaped apron joining and raised on turned tapered legs resting on delicate pad feet. 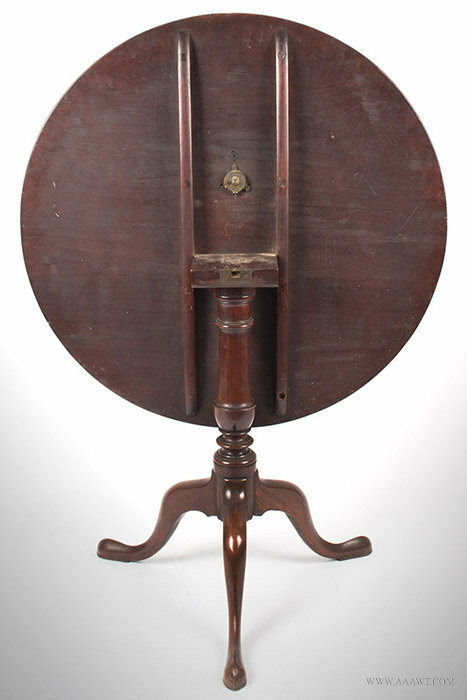 The generously proportioned single-board round-top attached to molded cleats pivots on a block affixed to the robust urn-turned standard raised on ridged cabriole legs ending on full pad-feet. 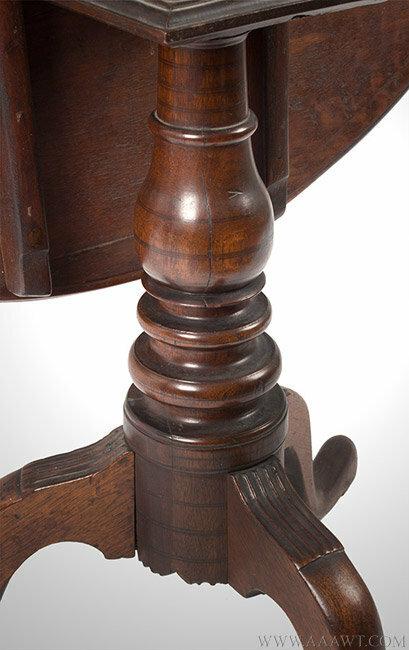 In the manner of Job Townsend and John Goddard, the pillar variant is a pleasant departure from the more common Palladian column. 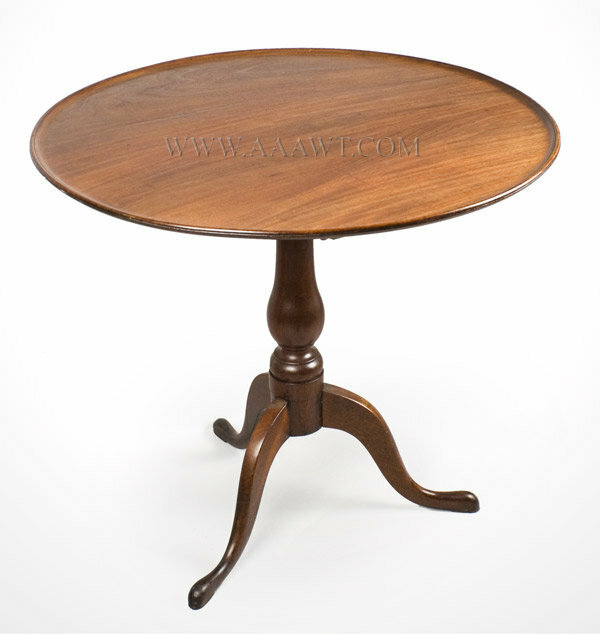 Classic details include signature shaped cleats, dish edge profile, and great wood. 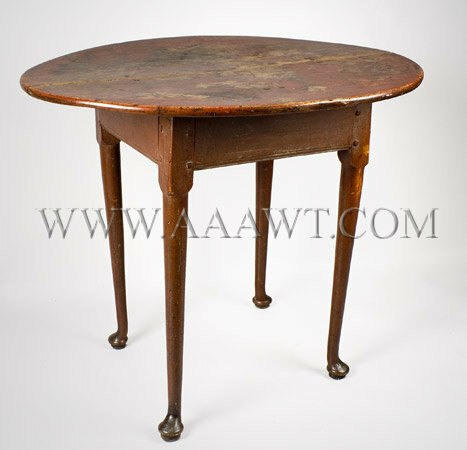 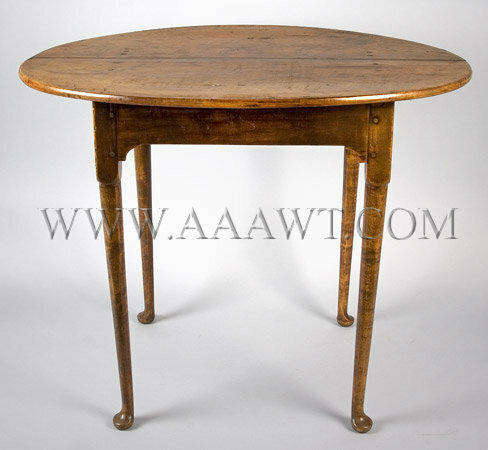 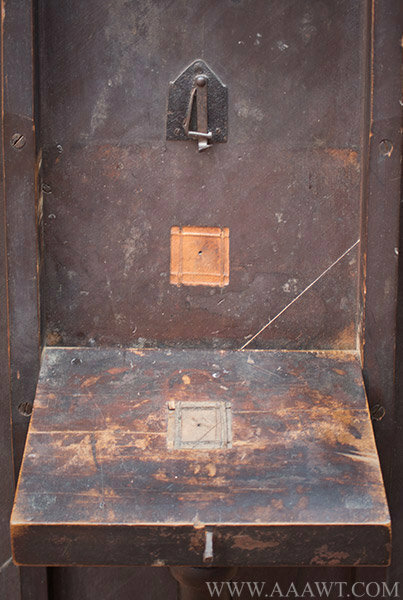 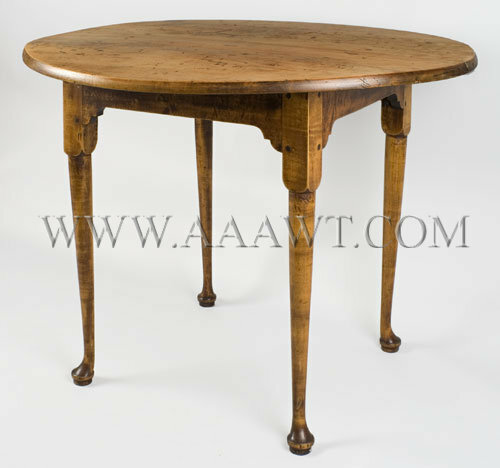 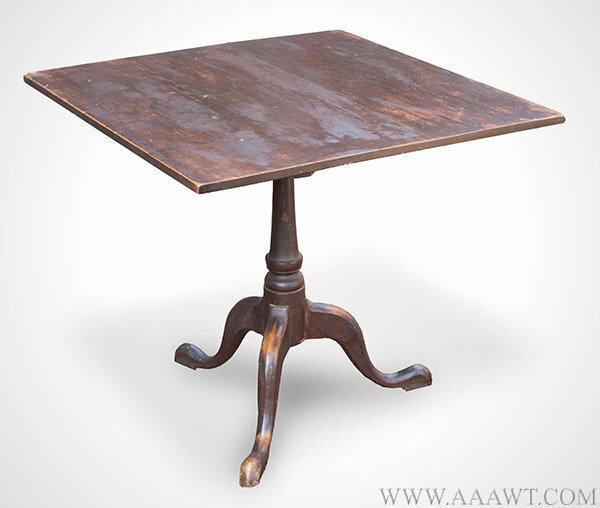 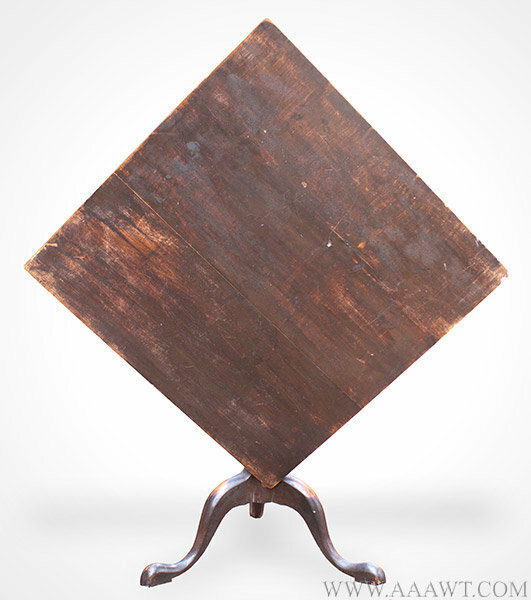 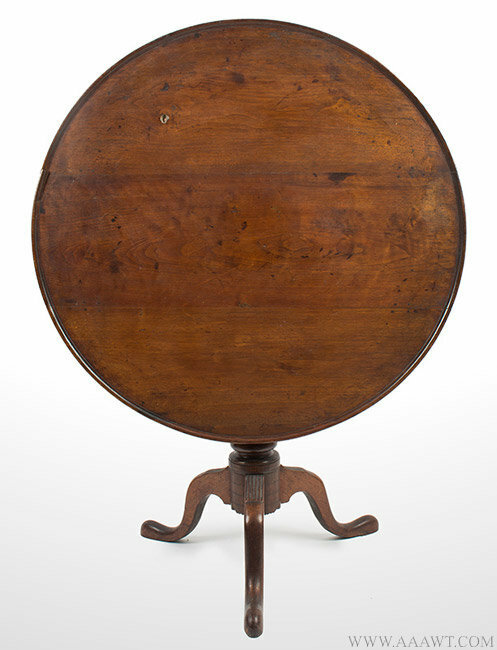 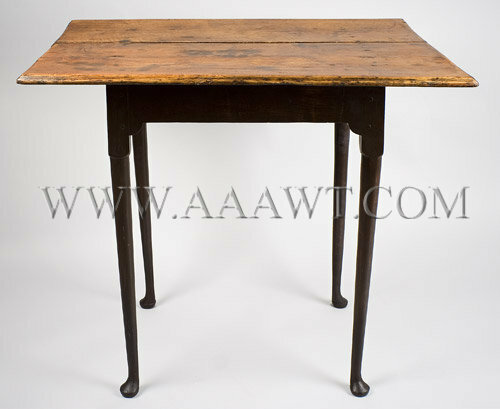 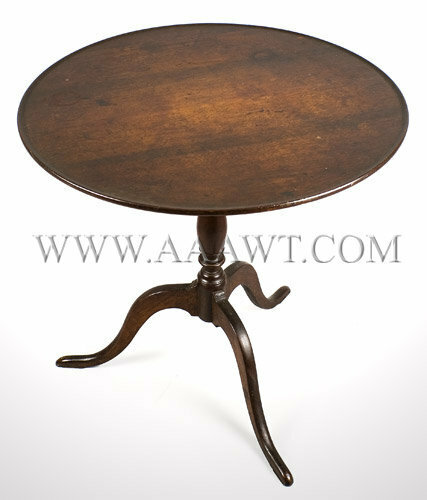 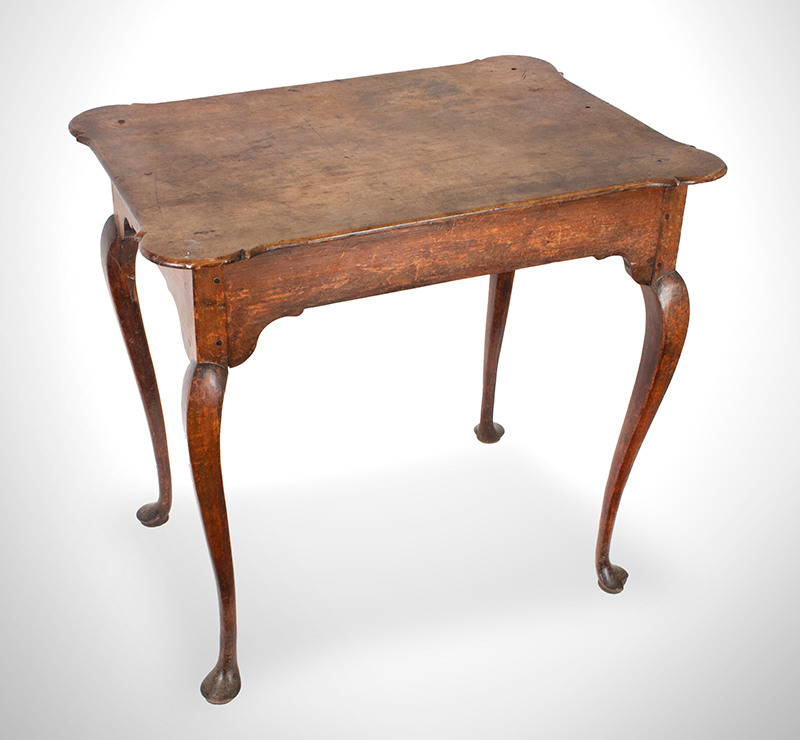 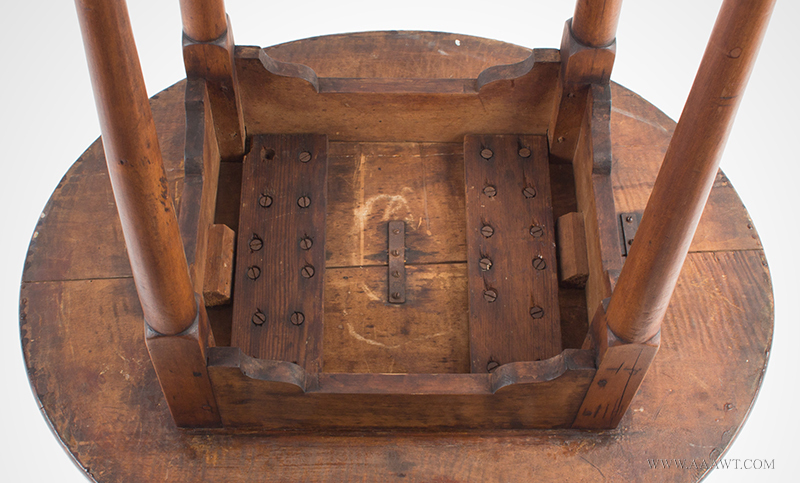 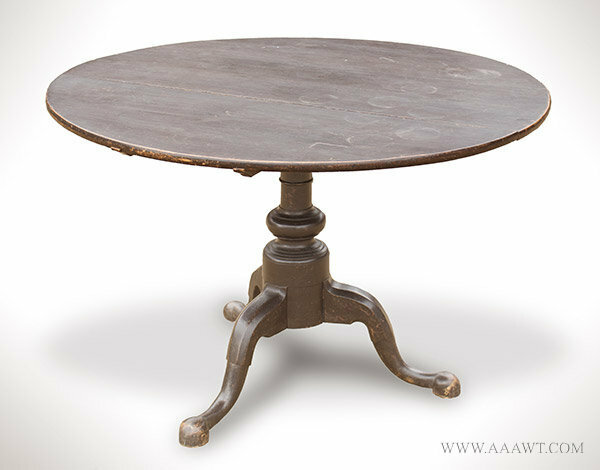 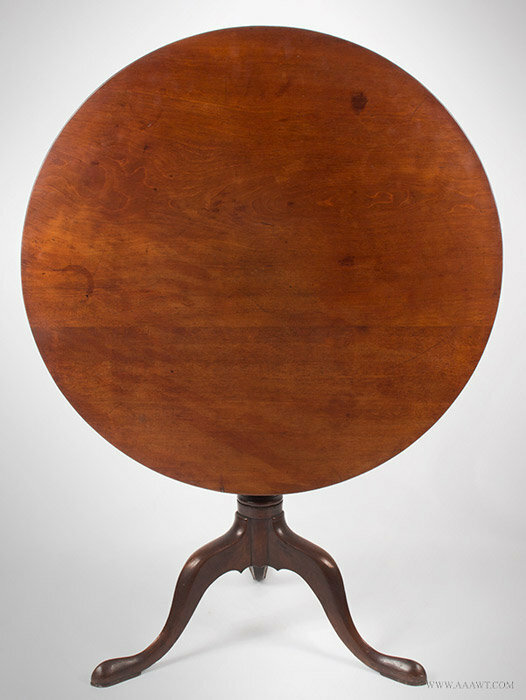 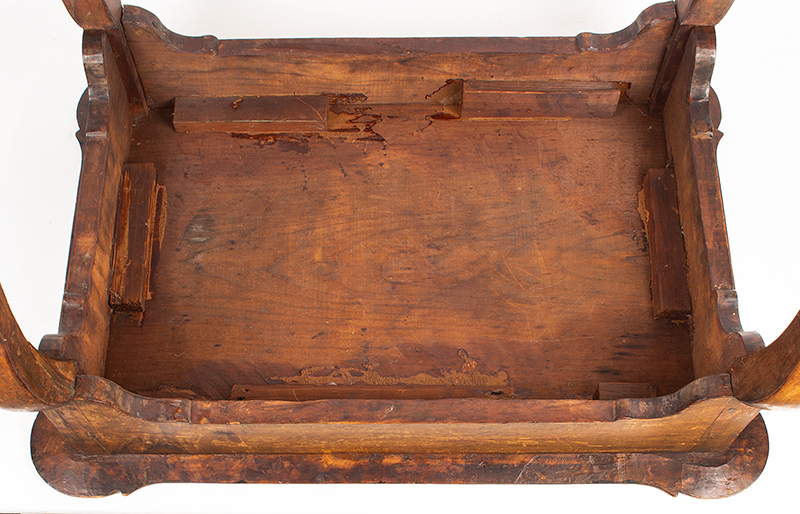 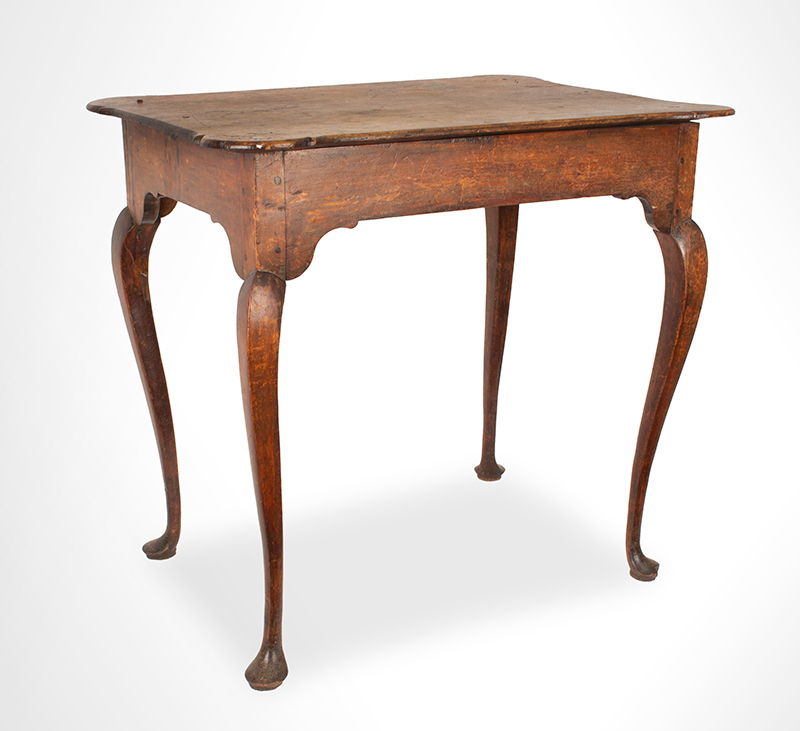 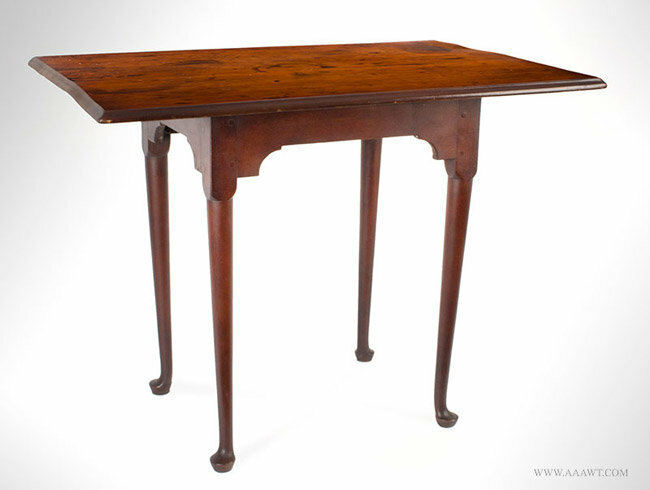 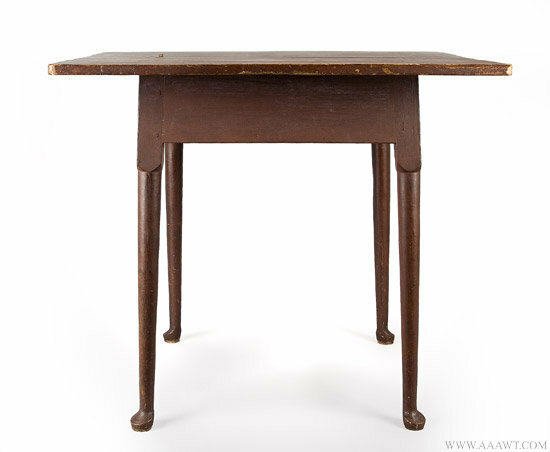 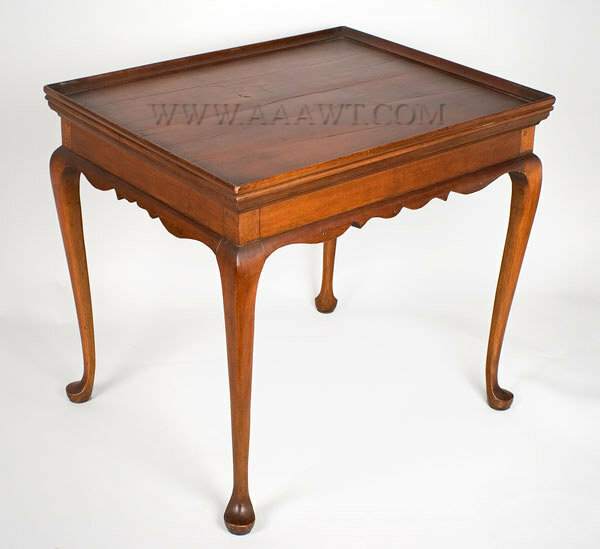 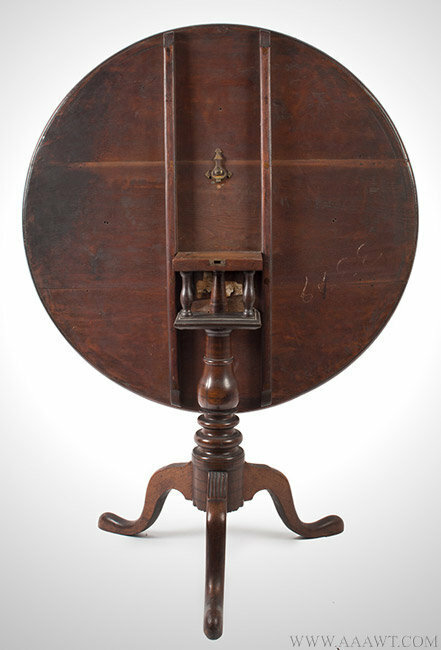 The molded two-board top on cut-out skirt raised on delicate tapering legs ending in fine pad feet; wood pins affixing the top are undisturbed; during its functional life a few nails were been added. 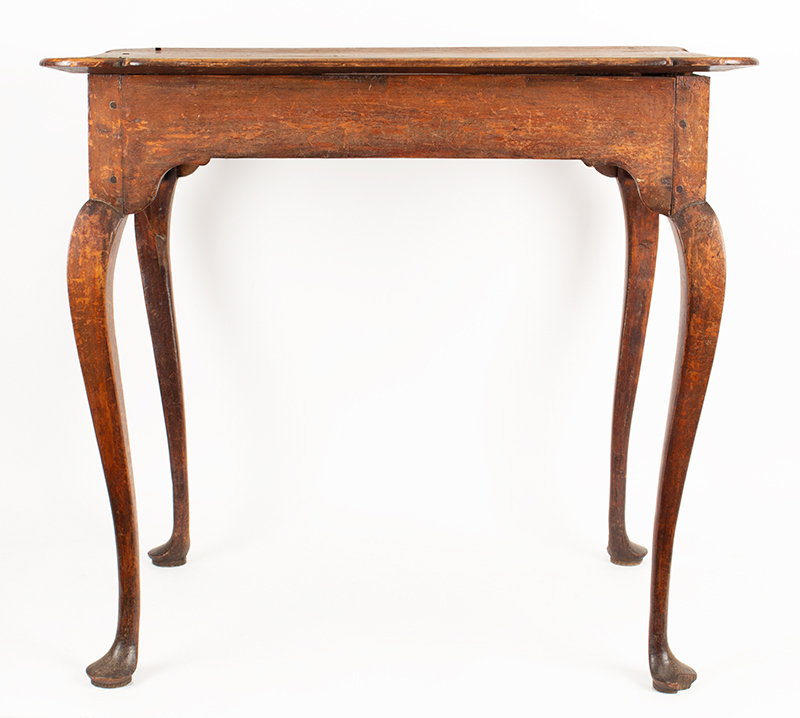 A lovely example with its top measuring 25 by 33"; H: 27.75". 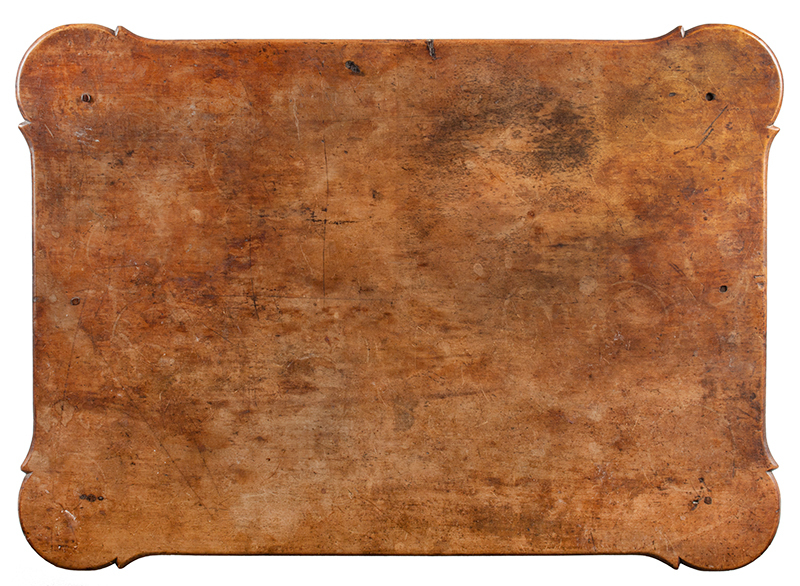 As depicted, generously overhanging top on plain apron raised on turned splayed legs Resting on pad feet. 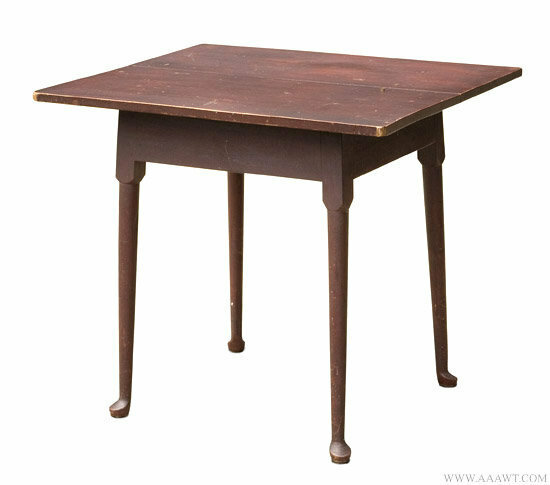 Table retains much of the original red painted surface; some additional nailing to top, all else fine. 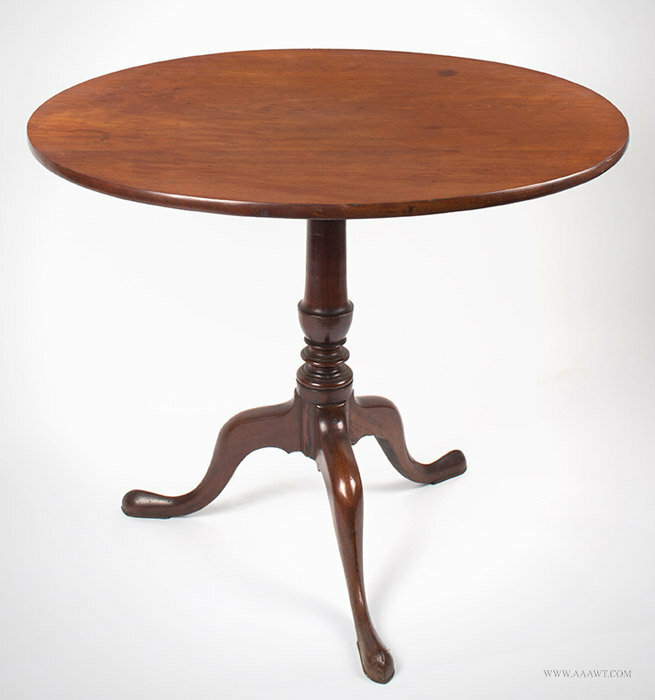 This example with generously proportioned round top; molded cleats secure the two-board top to the birdcage with turned posts raised on robust urn-turned standard raised on tripod base resting on feet with full pads.